On Saturday afternoon, Southampton host Leicester at St Marys, as the home side look for their league win of the season. Southampton have started their Premier League campaign with a draw against Burnley before losing 2-1 at Everton last time out. The Saints have now won just two of their last 14 top-flight games. In fact, the team from the south coast have now won just three times in 27 league outings. Mark Hughes side has been involved in a number of low scoring games of late in the top-flight, with under 2.5 goals scored in four of their last five league games. The Saints have struggled for victories on home soil in the Premier League of late, winning just one of their last 12 matches. A big factor in that poor recent home record is their inability to find the net, as the home side has failed to score in four of their last six games on home soil. However, one positive for the Saints is a decent home record against Leicester, as the home side has lost just one of the last seven games against the Foxes in the top-flight. Leicester have experienced mixed fortunes in the Premier League so far this season, losing against Manchester United before a 2-0 win over Wolves last time out. The win over Wolves was only their second top-flight victory in nine Premier Leagueoutings. Keeping the opposition from scoring has been a big problem for Leicester in recent Premier League games, as they have conceded at least twice in six of their last nine outings. The Foxes recent away form in the league has been woeful, as the side from the Midlands have suffered four consecutive defeats on their travels in the top-flight. Sportseconds predicts that these two teams will be hard to separate and that this game will end in a low scoring draw. On Monday afternoon, Saudi Arabia and Egypt go head-to-head in their last game of Group A at the World Cup. The pair has both suffered elimination from the competition, having lost their first two group games against Russia and Uruguay, who have advanced to the knockout stages. The two teams will be looking to avoid finishing bottom of the group. In fact, they have now failed to win in 12 matches at the competition, suffering ten defeats in the process. Scoring goals have been a problem for the Saudi’s at the World Cup, as they have failed to score in seven of their last eight games in the group stages. Egypt are participating in only their third World Cup and will be looking for their first-ever victory in the competition, as they have failed to win any of their six games in the tournament. A win would be a historical result for Hector Cuper’s team. Like their opponents, the Pharaohs have also had trouble scoring goals at the World Cup, as the African team have scored just once in their last five appearances. The fact that star man Mohamed Salah was not fully fit hampered their chances of a successful World Cup, as Pharaoh’s boss Cuper has recently stated. Egypt heads into this dead rubber on a winless run of eight games in international football. In fact, the African team suffered five defeats in those eight winless games. Sportseconds predicts that this game will end in a low-scoring draw, which would mean Saudi Arabia finishing bottom of the group. Click on the image for the results! Portugal scored 1.33 goals per match in the last six home matches. Portugal conceded 1.17 goals per match in the last six home matches. Algeria scored 1 goals per match in the last six away matches. Algeria conceded 2.17 goals per match in the last six away matches. Portugal have drawn against Belgium (Friendlies) in the last match. Algeria lost against Cape Verde (Friendlies) in the last match. Portugal had 10 goals in their last 3 home games. Portugal had 3 of the 3 previous games ended over 2.5 goals. Algeria had 9 goals in their last 3 away games. In the previous game, Algeria had 3 goals in total for the entire game. Algeria had scored in 2 of the last 3 games. Algeria had 2 of the 3 previous games ended over 2.5 goals. What can Betshare tell us about a betting market? It’s often assumed that the efficiency of a betting market, that is to say the accuracy of its betting prices, is a reflection of the preferences of a wise betting crowd and the bookmaker’s attempts at balancing or equalising the action on either side of a result. But is this necessarily the case? Without information about how many people are actually betting on particular propositions, and what money they are staking, we can’t be entirely sure how the market is being formed and managed by the bookmaker. Fortunately, Pinnacle.com, recognised as the world’s sharpest odds setter, publishes data on the percentage of customers placing bet via its twitter feed. This article analyses a sample of those percentages, called betshares, for the football total goals betting market to see what clues it might offer. Trawling through the last year or so of betshare tweets from Pinnacle.com, I have collected a sample of 200 football matches with the goal line (typically between 2 and 3.25) and the percentage of bets placed on both Over and Under. Also shown are the opening and closing odds for those lines (taken from Oddsportal.com). Matches include those from the English Premier League, German Bundesliga, Spanish La Liga, Champions League, Europa Cup and international competitions including friendlies. 75% of matches witnessed a preference for betting on the Over (betshare greater than 50%) whilst the average Overs betshare was 62%. This bias towards betting over the bookmaker’s goal line is something that other sources have reported, including betting social media platform Pyckio and sports betting analytics website SportsInsights. If we were to assume a priori that the expected betshare should be evenly distributed between Over and Under, such a bias is highly statistically significant (2-tailed, 2-sample paired t-test) with about a 10 in a quintillion probability that this difference over 200 matches would have arisen by chance. What are the implications of this bias? Well, firstly, if we were to assume that all bettors betting Over and Under wager roughly the same stakes on average, the bookmaker would be heavily exposed to losses should the Over win. The corollary is that the bookmaker should shorten his odds on the Over dramatically in an attempt to balance the action on both sides of the betting line. For example, for fair odds of 2.00 for both over and under 2.5 goals, a 62% betshare for the Over would necessitate odds shortening to 1.61, with a corresponding lengthening to 2.58 for the Under. Clearly, such a dramatic odds shift would create an obvious and significant value opportunity for Under bettors, which in turn would influence the betshare. Speaking to SportsInsights, Scott Cooley, an Odds Consultant for the market-setting Bookmaker.eu, makes the case that this is not what actually happens at all. Perhaps bookmakers are willing to be part of the action when required. Evidently, then, where bettors on difference sides of the line are staking in different way, the bookmaker is still able to manage his liabilities without having to offer too much value to the sharper bettor. SportsInsights have suggested that squares, those recreational punters who will more usually stake small to moderate sizes, have a tendency to pound the Overs. Sharps, by contrast, stake bigger and are more likely to focus on the Unders given the potential for value that might exist. Just how much value might arise in the Unders as a consequence of a preferential bias towards Overs, and does it cause systematic movements in the betting odds when it’s present. Let’s take another look at Pinnacle’s football total goals betting market. There is little point in analysing returns from betting on the Unders market from just 200 matches, since profitability can easily arise simply by chance. With average margins of 2.9% and 2.4% for opening and closing odds respectively, just a small deviation away from expectation could see a blanket betting of the Unders return a profit. Assuming an average bet win expectation of 50%, a 10,000-run Monte Carlo simulation confirms that we could expect to return some profit after 200 wagers over a third of the time. We need a much bigger sample to eliminate the role of chance. Analysing the over/under 2.5 goals opening betting odds from Pinnacle.com for 83,634 football matches played from 2007 to 2016 showed returns of 97.2% and 96.4% for blanket Overs and Unders betting respectively. The difference between the two is not statistically significant (p-value = 0.22, 2-tailed 2-sample paired t-test). Such evidence would appear to confirm that despite any preference towards Overs betting, Pinnacle at any rate are not offering up any meaningful value to sharps looking to exploit the cognitively biased preferences of squares. But these are opening odds, I hear you cry. Perhaps we’ll see some value appear by the time the market closes. That’s possible, so let’s take another look at our original sample of 200 matches, and see if there is any meaningful movement on those odds which correlates with the size of betshares. To ensure we’re comparing like with like between opening and closing prices, first we must remove the margin, since the opening market attracts a slightly bigger margin than the closing one. For simplicity I’ve assumed equal weight is applied to both Over and Under, probably a fair assumption give the rough equality in price and the small size of the overall margin. Doing this yields the following figures. To all intents and purposes there is, on average, almost no odds movement at all, and what little there is, is actually against the Overs which are preferred by the majority of bettors. Unsurprisingly, the difference between the Under and Over betting odds in this 200-match sample is not statistically significant (p-value = 0.26, 2-tailed 2-sample paired t-test). Furthermore, plotting the distribution of individual odds movements as percentage win expectation changes on a cumulative distribution chart (positive change implies closing odds shorter than opening odds) reveals them to be effectively normally or randomly distributed. Finally, we can see if the odds movement correlates in any way with the size of the betshare. A priori, if a preference towards the Overs was causing a shortening of their odds towards market closure we should see this as a positive correlation in a scatter plot; the greater the betshare, the greater the predicted increase in win expectation as implied by the betting odds. In fact, we see the opposite: the greater the betshare for the Overs option, the more it will actually lengthen between market opening and closure. The reverse is of course true for the Unders. This would appear to contradict the suggestion that the pounding of Overs by squares creates value opportunities for sharps in the Unders. On the contrary, on average the price for an Under shortens by closing for those with the least interest. Whilst this correlation is statistically significant (p-value = 0.001, linear regression), its strength is very weak with little more than 5% of the variance in the betshares accounting for the variance in the odds movement (r-squared = 0.055). Given that the price movements largely appear to be random anyway, this can hardly come as a surprise. With the average shift between opening and closing prices for the most disproportionate betshares barely 5%, on average at least there would seem be little theoretical advantage to be gained knowing betshare information. What does all this mean for the way a bookmaker like Pinnacle manages its total goals betting market? Without actual turnover data we are still very much in the dark about how liabilities are being managed precisely. We still don’t know to what extent so-called sharps betting Unders are out-staking their square counterparts pounding the Overs. And we still don’t know how much ‘action’ the bookmaker is prepared to accept himself and how often. Nevertheless, the insignificant difference between returns for blanket betting Overs versus Unders, the apparent random nature of odds movement between market opening and closure, and the very limited relationship between betshare percentage and price movement would seem to point to their being limited scope for developing a consistently viable betting system based on betshare knowledge alone. What is not in doubt is that bettors, as an aggregate, are heavily biased towards betting on the Overs market. In collecting the data for 200 football matches, I also collected Pinnacle betshare data for other sports as well, including Tennis and the four major American sports football, hockey, baseball and basketball. Across the 134 games for all sports, the same bias prevailed: 62% versus 38%. Individually, whilst sample sizes were small, the same preference for Overs betting existed for each: NHL 59%/41%; MLB 64%/36%; NFL 55%/45%; NBA 64%/36%; Tennis 65%/35%. 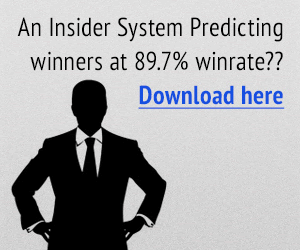 Perhaps the most intriguing question is why bettors prefer the Over? In my recent book Squares & Sharps I proposed a simple hypothesis: loss aversion. In prospect theory, loss aversion refers to the tendency for people to strongly prefer avoiding losses in comparison to acquiring gains. According to two Israeli psychologies, Amos Tversky and Daniel Kahneman who developed the theory, losses are as much as twice as psychologically powerful as gains in decision-making environments under uncertainty. One of the key principles of prospect theory is our irrational weighting of low and high probabilities, placing too much emphasis on the former and not enough on the latter. Previously I have suggested that this irrational weighting could be a contributing factor towards the favourite-longshot bias in moneyline/fixed betting odds. In an Over/Under betting market, our aversion to losses might be explained in the following way (taken from my book). Consider the nature of an over/under bet. By its very structure, at the start of a match, one side, the Under, is automatically a winner, and remains so until such time as enough goals (or points) are scored to transform it into a loser. In contrast, the Over starts out as a loser and remains so until such time as enough goals (or points) are scored to transform it into a winner. In light of what prospect theory informs us, bettors, conceivably, may prefer the possibility of seeing a loser transformed into a winner rather than the other way around. If losing hurts about twice as much as winning is enjoyed, the bias in favour of ‘losers into winners’ over ‘winners into losers’ would seem to make sense. Daniel Mateos, Pyckio’s co-founder, revealingly explains why he, too, suffers from an Overs bias. Conceivably, those bettors who intentionally fade squares by focusing on the Unders have given more thought to their betting and will more readily resist the temptation to be influenced by this psychological bias. If that is true, we might also expect such disciplined bettors to contain a disproportionately greater number of sharps than those merely betting on gut instinct. Arguably, then, such a subset of bettors would show larger staking volumes, thereby providing the mechanism described by Pinnacle.com to account for a relatively unchanging market despite heavily skewed betshares. Nevertheless, whatever the reality of actual betting volumes and bookmaker liability, the odds layer in an Over/Under betting market appears to be very reluctant to give any advantage away at all. Scoring 50 goals in 50 games is the crowning achievement of an NHL goal scorer. Players who do so join a club of legends including Wayne Gretzky, Mario Lemieux and Maurice Richard. The club is exclusive — it has only five members, and it hasn’t accepted a new application in 25 years. There are dozens and dozens of active NHL players who weren’t alive yet the last time someone scored 50 goals in 50 games, when Brett Hull did it during the 1991-92 season. As with throwing dead octopuses onto the ice and shaking hands with the opponent after a playoff series, the 50 in 50 club is like many things unique to the NHL: steeped in history and perhaps devoid of logic. The attention bestowed on the exploit dates back to the days when there were only 50 games on the schedule. So when Richard became to first to do it in 1945, it meant he averaged a goal a game for a whole season. When the schedule expanded to 60 games — and then to 70 games, and then 74, 76, 78, 80 and 84 games, finally settling at 82 games — 50 in 50 remained a thing. Because, you know, why not? Like with many exclusive clubs, there are also a lot of rules. To gain access, you must score 50 goals in your team’s first 50 games, not your own. Alexander Mogilny scored 50 goals in his first 46 games in 1992-93, but an injury forced him to miss three weeks at the beginning of the season. Mogilny’s 50th tally came in his team’s 53rd game, so he’s not allowed in. No exceptions! It’s not easy to sustain a goal-per-game pace for 50 consecutive games, but so far this season, Tampa Bay’s Nikita Kucherov is doing almost exactly that. With 14 goals in 15 games, the young Russian with a hellacious shot has set himself up to make a legitimate run at hockey’s goal-scoring holy grail. Of course, many others have started the season on a similar tear in recent years — and all of them ended up way short of the benchmark. Here’s how every player who notched at least 14 goals in his team’s first 15 games post-lockout stacked up against the last three 50/50 players. Amazingly, only one of these players (Jaromir Jagr in 2006) exceeded 50 goals on the season, let alone in 50 games. In the 2005-06 season, winger Simon Gagne scored 17 in the Flyers’ first 15 games, but he ultimately scored only 17 more in the next 35. In that same season, both Dany Heatley and Daniel Alfredsson had 15 goals through the first 15 games. They both cooled, too — like Gagne, they each netted 17 goals in the following 35 games. But there’s reason to believe this year might be different: The league itself seems different. So far this season, goalies are stopping pucks with less success than they have since 2008-09. But not all of the blame can be placed on lackluster goaltending — a number of rule changes have led to an increase in power play opportunities per game. More power play opportunities equal more high-quality scoring opportunities, which means more goalies left hung out to dry. It’s not shocking to see an analog in the 2005-06 season, when Jagr, Gagne, Heatley and Alfredsson each flirted with a goal-a-game pace: The league instituted rule changes in the wake of the 2004-05 lockout with the express purpose of increasing the number of goals per game, which had tanked in the NHL of the late 1990s and early 2000s. Chief among those rule changes was the elimination of the two-line offside pass. Defenses were slow to adjust to the rule change, which led to a preponderance of breakaways and two-on-one situations. Kucherov isn’t the only one taking advantage of the increase in scoring. Like during the 2005-06 season, this year’s NHL has a handful of players vying for NHL legend status. Alex Ovechkin has also started the year on fire (13 goals in 16 games), while Islanders’ captain John Tavares has 12 goals in 15. Of course, a goal scorer is nothing without dime-dishing linemates, and Kucherov has benefited from playing with the league’s leading point getter in Steven Stamkos (who missed 65 games last season, and the Bolts missed the playoffs). Stamkos is known best for his goal scoring prowess — he’s a two-time recipient of the Maurice “Rocket” Richard Trophy, awarded to the league’s top goal scorer — but this year it’s his passing that has him at the top of the NHL’s scoring list. He’s still scoring goals, but his 18 assists pace the league. And 10 of those helpers have come on goals scored by Kucherov. Every player to hit the 50-goals-in-50-games milestone played on a line with one (or two) very good passers. Lemieux — who also unofficially scored 50 in 50 in two other seasons3 — played the bulk of his career on lines with some combination of Jagr, Kevin Stevens and Ron Francis. Hull played on a line in St. Louis with Adam Oates. Gretzky had Jari Kurri, Mike Bossy had Bryan Trottier and Clark Gillies, and Richard had Elmer Lach and Toe Blake. And it’s not a stretch to place Kucherov and Stamkos among these all-time great duos and trios. Kucherov’s gaudy numbers aren’t surprising — he’s scored no fewer than 29 goals in each of his three full NHL seasons and has an astounding career shooting percentage of 15.1. But that historically good shooting percentage is up dramatically this season: At the moment, Kucherov is scoring on 24 percent of the shots he’s taking. That’s destined to regress to the mean, but for now, Kucherov’s shot looks damn near unsavable. Who knows if Kucherov — or Ovechkin or Tavares — can sustain a goal-per-game pace for all 50 games. Even if they don’t, they’ve already made the NHL feel a little bit like the wild old days of the ’80s and early ’90s. And they’ve given every hockey nerd something to pull for. The famous adage that “football is a funny old game” is very true. Not many would have predicted that Aston Villa would get a 3-1 win over Arsenal at the weekend or believed that Wigan would beat Manchester City in the FA Cup final last year. However, more often than not, with careful analysis and an insightful approach, you can make informed decisions when pursuing betting tips around the beautiful game. However, not many of us have the time or ability to sift through form guides, analyze trends, take into consideration team dynamics and look into all the other different factors that will play a major part in deciding a game of football. This is where BETEGY comes into play. BETEGY is a new innovative and fully automatic online service that provides football predictions based on a wide range of factors. It uses its unique, self-learning algorithm to process a variety of statistical indicators such as number-based information such as form and league position, and couples it with football news related to transfers and suspensions. BETEGY used methodical models and assesses team dynamics based on the progression or regression of a certain team, and produces reliable and complex betting tips for you to use to make money. Sounds complicated? All you need to really consider is the fact that BETEGY has been proven to predict the outcome of a football match with up to an 80 per cent probability of success. In the opening weekend of Premier League action, BETEGY successfully predicted six out of ten of the game predictions, and had all three of its tips for the round of fixtures correct. Of its ten recommended tips, nine paid out. Most British football fans have an strong idea of who will win a match-up between Manchester United and Crystal Palace. However, what’s your knowledge of the Japanese J-League or the MLS in America like? BETEGY provides precise predictions on 22 of the most popular leagues in world football, with access to five of them coming completely free of charge. The interface at BETEGY makes it easy for you to take in all the facts, figures and make an informed decision to turn betting tips into cold, hard cash. Both teams to score Bet. This ensures that in tight games that are usually difficult to pick a winner, you can use more statistical information to place a bet that is more likely to guarnatee a win. One of the most positive things about BETEGY is that there is no human involvement in the process, which makes it impartial and not subject to any underlying bias. The self-learning algorithm ensures that only statistics and relevant information is used to determine the predictions – no gut feelings or hunches like anyone in the bookies can have for themselves. BETEGY, despite being in its early days, has already started to shoot into the public limelight and is starting to be noticed. German investment fund bmp media investors liked what they saw and have recently made a commitment to help to fund this revoluntary new betting aid. Leading American media outlets such as CNN Money and The Wall Street Journal have publicized the betting aid after being convinced of its ability to assist in making the average punter money through thorough and diverse analysis. For more information or to check out the excellent betting tips that can revolutionize the way you wager, visit the BETEGY website today. Somehow, the New York Giants’ season just keeps getting worse. The Giants were 0-4 heading into last week’s game against the Chargers, also 0-4, when things took another tumble. Star wide receiver Odell Beckham Jr. suffered a fractured ankle and he will likely miss the remainder of the regular season. Yes, the Giants lost, 27-22, for their fifth straight defeat of the season. This is fresh off an 11-5 year in which the Giants earned a wild card. Now, they head to Denver to face the 3-1 Broncos who are coming off a bye week. The problems on offense for New York stem from an inability to run the football. The Giants average 77.8 rushing yards per game, 30th in the NFL. Without the ability to run the ball, teams can rush QB Eli Manning and the results produce just 16 points per game for the Giants. With their best offensive player now out, things might even get worse. If Beckham’s injury wasn’t enough, receivers Brandon Marshall and Sterling Shepard both left last Sunday’s game with ankle injuries. For Denver, running the football has helped QB Trevor Siemian to grow up in the Broncos offense. Denver averages 143 yards per game and RB C.J. Anderson is fourth the league in rushing with 330 yards. Siemian has been efficient completing 62.7 percent of his passes and has thrown more touchdowns (7) than interceptions (4). The Denver defense appears to be back to Super Bowl form yielding just 260.8 total yards per game, tops in the NFL. Teams average just 50.8 rushing yards against the Broncos. That is not what the Giants want to hear, but if Manning is going to have any success they will have to find a way to run the ball. Denver has beaten the Giants three of the past four times the two teams have met. They last played in 2013 when Denver scored a 41-23 win at MetLife Stadium. The last remaining unbeaten in the NFL gets a rematch of its divisional playoff game last season when the Pittsburgh Steelers visit Arrowhead Stadium on Sunday. The Steelers came to Kansas City last year and earned an 18-16 victory and a trip to the AFC championship. Now, Pittsburgh comes to Arrowhead on the heels of a huge loss to Jacksonville in Week 5. Pittsburgh QB Ben Roethlisberger threw five interceptions last week and two were returned by Jacksonville for touchdowns in a 30-9 loss. When Roethlisberger throws picks, the Steelers lose. It’s pretty simple for Pittsburgh. Don’t turn the ball over and the Steelers will have a chance for success. The Chiefs have the NFL’s best offense right now averaging 32.8 points per game. They can thank the league’s second-best rushing attack for that. Rookie Kareem Hunt has been spectacular rushing for 609 yards and four touchdowns. He also 16 receptions for 166 yards and two more scores. Hunt, WR Tyreek Hill (356 yards, 2 TDs), and QB Alex Smith (1,391 yards, 11 TDs) have led Kansas City to its best start in recent years. The bad news for the Chiefs is that they may be without TE Travis Kelce and WR Chris Conley was lost for the season when he tore his Achilles tendon last week. Kelce will have to pass the league’s concussion protocol in order to play this week. He suffered a hard hit in the second quarter of last week’s win over Houston. The Chiefs defense has been suspect at times. They did give up 34 points last week to the Texans and Pittsburgh has the kinds of weapons that can put up points by the dozens. Running back Le’Veon Bell (371 yards) and WR Antonio Brown (545 yards receiving) have been relatively quiet thus far this season. The Kansas City defense will have to keep them quiet. The two teams have played in each of the last three regular seasons. Pittsburgh is 2-1, but both victories came at home. The Steelers lost at Arrowhead 23-13 back in 2015. On Thursday night, the Eagles and Panthers will get to challenge each other for NFC supremacy. Both teams enter Thursday with 4-1 records. Carolina is coming off back-to-back impressive victories over the Patriots (33-30) and the Lions (27-24). The Panthers defense is solid and QB Cam Newton is on a roll. Philadelphia’s only loss thus far is to the NFL’s only unbeaten, Kansas City, back in Week 2. The Eagles have three consecutive wins thanks to the improved play of second-year quarterback Carson Wentz. Last year’s No. 2 overall pick has 1,362 yards passing and 10 touchdowns so far. In last week’s 34-7 win over Arizona, Wentz threw for 304 yards and four touchdowns. What has really helped Wentz’s development is an Eagles running game that is fifth in the NFL averaging 138.8 yards per game. Leading the way is LeGarrette Blount who has 323 yards rushing. Wentz’s go-to receiver has been TE Zach Ertz who has 32 catches for 387 yards and two touchdowns. The Carolina defense will have its hands full trying to stop the Philadelphia offense. Carolina could take a page from the Eagles’ playbook and do a better job of running the ball. The Panthers only ran for 28 yards in their win over Detroit last week. Newton more than made up for it with 355 yards passing and three touchdowns. It’s not that the Panthers lack talent. They have the dynamic rookie Christian McCaffrey as well as wide receivers Kelvin Benjamin (team-high 272 yards) and Devin Funchess (team-high 3 TDs). Even tight end Ed Dickson (11 catches, 271 yards) has done an admirable job in replacing injured Greg Olsen. The Panthers defense is why Carolina is 4-1. Julius Peppers leads the team with 5.5 sacks and Kawaan Short and Mario Addison each have three. Carolina is third overall in the league giving up just 274 total yards per game and eighth in scoring defense yielding 18.8 points. If not for the gracious gods of scheduling, it is highly likely that the Indianapolis Colts would be winless heading into Week 6. As is stands, the Colts, who possess the NFL’s worst defense, are 2-3 and will battle for positioning in the competitive AFC South Division when they travel to Tennessee to take on the Titans on Monday night. Tennessee, also 2-3, will probably have to play again without starting quarterback Marcus Mariota who is nursing a hamstring injury. The Colts, who give up an NFL-worst 31.8 points per game, were lucky enough to face Cleveland and San Francisco in the first five weeks of the season. Both are winless thus far this season and represent the Colts only two wins. Indianapolis almost gave away last week’s game to the 49ers, but rookie RB Marlon Mack, who had 91 yards rushing, set up an Adam Vinatieri 51-yard field goal to earn the victory in overtime. Indianapolis has its own quarterback problems starting Jacoby Brissett in place of the injured Andrew Luck. Brissett played well in the win over San Francisco throwing for 314 yards and a touchdown. Without Luck, the Colts offense has been lackluster scoring just 19.4 points per game (22nd in the NFL). For Tennessee, they will have to make do with Matt Cassel at quarterback. The Titans have lost consecutive games and have scored just 24 points total in the two losses. It would help if the normally strong Titans running game could take some of the pressure off of Cassel. Tennessee is ninth in the league in rushing offense averaging 124.8 yards per game. Last week in a 16-10 loss to Miami, the Titans managed just 69 yards on the ground. To make matters worse for Tennessee, the Titans have lost 11 straight to the Colts. The Titans last win over Indianapolis was in 2011. It is the only Tennessee win over the Colts since the end of the 2008 season. Place a bet on totals.Betting on totals means making a guess as to the average goal count per team in a game. These bets are usually made as “under 2.5,” “over 2.5,” or over/under some other number. This means that you are betting that the average goals per team in the game will be over or under 2.5 (or some other close value). For instance, assume you made a bet that totals would be under 2.5. If both teams scored three goals, the total will be six. Divided by two (the number of teams in the game), you end up with the number three. In that case, you would lose the bet, since the total was above 2.5, not below. Betting on goal lines means making a bet based on what the difference in two teams’ scores will be. Like bets on totals, these bets are made as an over/under statement, typically “under 0.5,” “over 0.5,” or over/under some similar value. For instance, if you bet “over 2.5” on a game, it means that you believe the winning team will be victorious by at least three goals. When betting on goal lines, you usually need to call the bet as well by indicating which team you think will win. For instance, you might bet, “France +2.5 goals,” meaning you believe France will win the game by at least three goals. Keep the over/under value relatively low. The higher the goal line bet you make, the riskier it is to win it. This type of bet is also known as betting on point spreads.